Mary J. Blige was born on January 11, 1971 in Yonkers, New York, USA as Mary Jane Blige. She has been married to Kendu Isaacs since December 7, 2003. Just in Time for Summer I'm Single!!! Sits Front & Center at Oscars Lunch ... In Front of Meryl Streep! No More Drama, Just Sunnin' My Buns!!! Ordered to Pay Spousal Support Way Under $129k/Mo. Ex Is Holding My Grammy and 2 Cars! 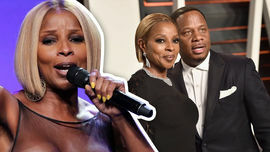 Mary J. Blige Is Officially On The Market!